None of You Have Evidently???? There is an item of cost that none of you have evidently yet encountered. Here's an example: Ohio state Fair required us to purchase a eight hundred dollar permit from the Fire Dept., they also told us that we will have an off duty fireman at the show for all the hours we were open at a cost of thirty five dollars per hour. A local newspaper had an article that they published in advance of the fair that stated we would have a "sword swallowers and fire eaters performing at the fair" the fair office wanting to help us, purchased the permit, which we had to pay them back, that was 2009. When the assistant Fire Chief came to the show, I asked if he would like to see Poobah eat the fire, he was going to do it on the bally stage, he said yes. So little Pete "Poobah" lit the two small torches and extinguished them in his mouth. The fireman said "That's it? That's the whole thing!!!!. I told him "yes". He replied" I don't think he needs a permit to do that." So we didn't have to have the fireman at thirty five dollars per hour either. We already had paid the eight hundred dollars for the permit. Still we were not allows any fire inside the fireproof tent, we weren't permitted to even light a torch on the electric chair. So Poobah "Ate Fire" on the outside bally. Fast forward to 2010. We didn't apply for a permit that year and they wouldn't let us have have fire even on the bally stage. Fast forward to 2011. There is no flame of any kind at "World of Wonder" while at Ft Lauderdale Fl. We had fire on the bally the first night, and were told we couldn't do it again. We were told that "It is too close to the public." We have had similar experience at other spots. On inquiry that history seems to go back to the tragedy in a night club in Warwick, R. I. a few years ago when many people were killed by the fire ignited by a person performing on the stage. 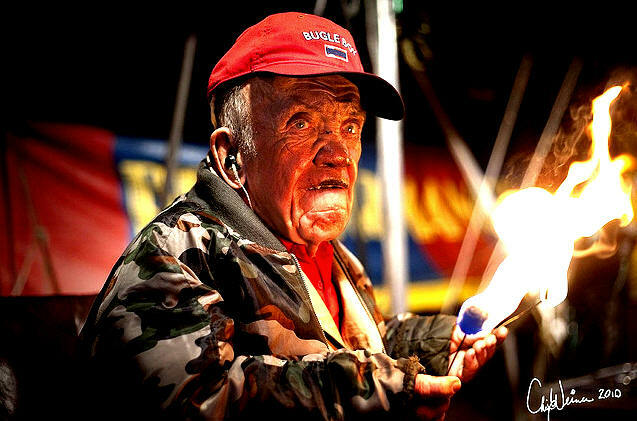 It's kind of ironic even though we weren't permitted to have a fire act on the sideshow at Ft Lauderdale, they had a fire juggler with large torches who performed several timed each night.